I've just experienced my first El Bulli recipe failure. It wasn't pretty either. I was trying to make El Bulli's Mexican fried tacos. 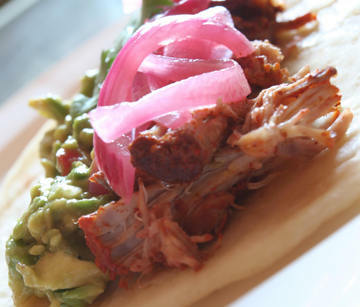 The observant among you will notice this post is about cochinita pibil. There are a handful of recipes in the El Bulli: 1998-2002 that call for fried corn. Fried corn? I guess there are just some things you have to figure out for yourself in this world, because nowhere in the book or accompanying CD can I find a preparation for it, and I've certainly never heard of it used anywhere else. That should have stopped me, but it didn't. So I set about the other day -- two tins of sweet corn and some olive oil in hand -- to making an improvised version of fried corn. I fried and fried, and occasionally slapped Rachel's hand as she tried to eat kernels of hot, freshly fried corn. It is tasty, especially with a dash of salt. Corn fried, I was ready to make the taco shells, which are a mix of the corn and a croquant made of fondant, glucose, and isomalt. The ground fried corn should have the consistency of a powder, but when I tried grinding my fried corn I ended up with a paste -- a sort of Mexican-Italian fusion fried corn pesto. It's not pretty, trust me. It helps to have a backup, though ours doesn't come from a cookbook, unfortunately. We had some leftover banana leaves from our Kalua pig adventure, and we were pondering ways to use them when our friend Ryan asked me if I'd ever heard of puerco pibil. I hadn't, but after a quick search I decided it was the answer to our banana leaf surplus, and our dish for the Mexican edition of the Weekend Cookbook Challenge. Cochinita, or puerco pibil, is a traditional Yucatecan preparation for pork shoulder, a cut of meat for which I had no intention of devoting two consecutive posts, but which fate happily keeps sending my way. The key to this dish is the marinade. There are any number of ways to prepare it, but there are only a few primary ingredients from what I can tell: bitter orange juice, garlic, and achiote paste. Achiote paste is a blend of spices comprised of annatto seed mixed with allspice, cumin, and other aromatics. Annatto is essential, but everything else is a matter of taste. Large chunks of pork shoulder sit in this marinade overnight. The pork and marinade are then wrapped in banana leaves and foil, then buried in a pit (the pibil) and cooked over smoldering embers until the pork is tender enough to be shredded. The dirt pit in our apartment wasn't working, so we used our oven instead. For an entertaining demonstration of this recipe, check out the DVD edition or Once Upon a Time in Mexico. Robert Rodriguez, the film's director, includes a ten-minute, video special feature of his version of the dish, including his recipe for achiote. The pulled puerco is very good, though we preferred the pulled Kalua pig. We enjoyed the finished Mexican dish more than the Hawaiian, however, because the accompaniments make it spectacular. Start with fresh flour tortillas from the Lone Star Texas Grill. Admittedly, corn tortillas might be more appropriate, but the tortillas at the Lone Star are homemade and made fresh to order. They put store-bought tortillas to shame. Topped with the pork, our unbelievable guacamole (find the recipe here), and small handfuls of pickled red onions, and you've got a dish so good I'm willing to eat it until my belly is painfully swollen with Yucatecan delicousness. What can I say about pickled red onions to properly express how brilliant they are? Fresh and crunchy, but with a bright citrus taste and a surprisingly mellow onion flavour, they are my new favourite condiment. Enjoy them on any Mexican dish, on burgers, eat them as a pickle, but just eat them! They're so good I want to give Rick Bayless a big taco-flavoured kiss. Copy his recipe and make them, but with one modification: substitute the orange and lime juice combination with bitter (aka Seville) orange juice, if you can find it. In Toronto, you can find pre-made achiote paste, annatto seed, bottled bitter orange juice, and frozen banana leaves at Lively Life International Fine Foods in the St. Lawrence Market. Though I haven't checked, I'm reasonably certain all of these ingredients are available at one of the many Latin American groceries in the Kensington Market. The road to culinary enlightenment has some serendipitous bumps and detours. Cochinita pibil and pickled red onions may not be El Bulli's Mexican fried tacos, but they sure are a delicious sidetrip off the beaten path. I'm currently researching picked onions for a summer feast I'm prepping... this recipe is interesting in its lack of vinegar. Hmmmm. Hey Rob, as far as I can figure, 'fried corn' probably refers to 'maiz frito', a crunchy packaged snack in Spain that bears more than an uncanny resemblance to 'corn nuts' in the Western hemisphere. Might this be the key to those fried corn tacos? I eagerly await the re-attempt! Hi Rob, you could also try dehydrated corn which I've seen at Whole Foods here. I've used the dehydrated strawberries, powdered them in a coffee grinder, then sifted, for a fine powder with which I made an isomalt, glucose and powdered sugar croquant as well. Worked fine! Whatever you try, best of luck. I just recently had this at a Mayan restaurant while on vacation in Playa del Carmen. It was great. I wrote about it and everything else I could remember eating on my site. If you do find a good recipe for corn tortillas, make sure to post it, because I'd love to recreate the ones I had.